Lionheart Pilotage is a boat charter business, based in Jersey, Channel Islands and its primary focus is to support open water swimmers in their long distance swimming goals in and around Channel Island waters. 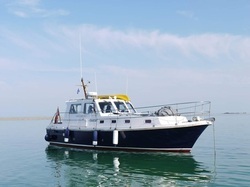 Lionheart is equipped with everything that swimmers and their support crew may require:"
Forward cabin with twin/double berths"
Flushing toilet, shower & wash basin"
Hot & cold running water"
Large galley with oven, grill and two gas rings for boiling water etc for feeds. As well as another sink, there is also a large fridge with ice tray."